China said Thursday it had sent a maritime patrol vessel to the disputed waters of the South China Sea but insisted it remains committed to peace in the region despite tensions with its neighbours. Beijing had pledged it would not resort to force to resolve maritime territorial disputes, after the Philippines this week sought help from the US and Vietnam staged military exercises. 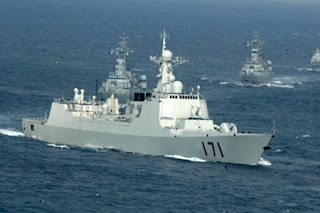 "On June 15, the... ship from the Maritime Safety Administration of Guangdong left for Singapore for a regular visit," foreign ministry spokesman Hong Lei said. In order to get to Singapore, the vessel must traverse the South China Sea.